To an outsider with no particular affection for the foreign policies of either US political party, the chief interest of the mid-term elections lies in their ramifications for the rest of the world. One of the most striking features of current Iraq discussion in the United States is that much of what is being said is based on the false premise that there exists a radical “third way” territorial solution to the Iraq crisis: a tripartite division of the country… Full story here. Among the internal provincial borders of the eastern Ottoman lands, the old boundary between the vilayets of Mosul and Baghdad has historically been the most momentous one in international affairs. 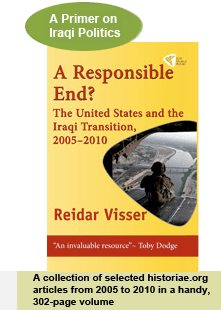 But the line that divided Baghdad from Basra could in the future become equally important – as a factor in Iraqi politics, in wider regional power struggles, and not least in geopolitical conflicts over energy resources. Already today, the heated debate about new federalism legislation in the Iraqi parliament has shown that this ancient border relates to regional sentiments that on certain issues pit Shiites against Shiites… Full story here. There is nothing new in Westerners making facile generalisations about Iraq and its people. Ever since the 1990s, strange maps of a tripartite Iraq have been bandied about, purporting to illustrate an Iraqi society subdivided into three homogenous “ethnic” blocs. Today, after the Democratic election victory in the United States, “territorial solutions” to the Iraq crisis are receiving renewed attention, as part of a possible “Dayton–style solution” to the Iraq crisis… Full story here.